Welcome everyone! 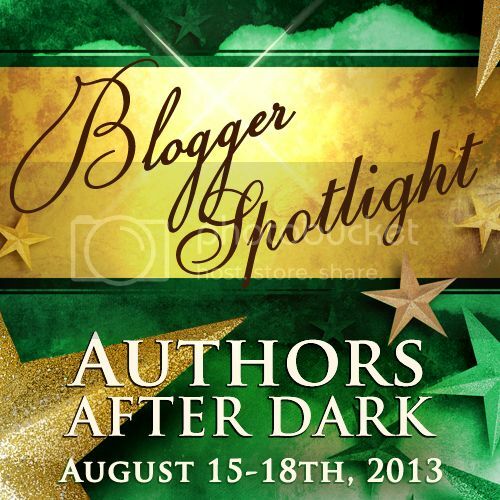 I wanted to give a shout out to all of the featured bloggers that have spent the last 9 months helping everyone get to know the featured authors for Authors After Dark Savannah Nights! Don’t miss checking out all of the author spotlights each one of these bloggers have done! A huge thank you to Robin at Robin Ludwig Designs for creating the graphic below in record time and all the other beautiful graphics for Authors After Dark! Today I have Jen from Romancing the Book! Welcome Jen!! My name is Jen and I’m the “fearless leader” at Romancing the Book. This summer we’re celebrating our 5th anniversary. We’ve gone through several incarnations in those 5 years, but in early 2010 we finally became Romancing the Book and decided to focus on the world of romance novels. Which authors are you going to be stalking? Melissa Schroeder for sure. Probably Jennifer Estep as well. Oh, and I have to get MaryJanice Davidson’s autograph for my sister. Do you have your itinerary for the panels lined out yet? If so, which panel are you the most excited about? I honestly haven’t even thought about it yet. I’ll be attending another book conference in Vegas the week before AAD, so my brain is overloaded with travel details and such. I’m a military brat, so I’ve grown up all over the place. But I’ve been in Washington State since I graduated from high school… so nowdays I claim Spokane as my hometown. I loved Nancy Drew as a child. I can’t say that I had a favorite book, but every once in a while I’ll pick up a random Drew book to go back down memory lane. Blogging actually wasn’t my idea. My blog partner and old high school BFF, Jessica… who mostly does behind the scene work these days, had been wanting to do a blog for a while and she asked me if I’d be interested in blogging about books since we read different genres. I said why not. The early days were us just talking about the books we read with some pretty crappy reviews. Then we decided we wanted people to actually READ our blog, so we started reaching out to authors to guest with us, which resulted in review requests. When Jessica took a backseat role in 2010, we reinvented ourselves to focus on romance novels. What is your biggest pet peeve in a book? My biggest pet peeve is editing errors. I get that some mispellings and grammar mistakes will slip through. But when a character’s name is spelled several different ways over the course of the book…. I get frustrated. Or when little things like a characters age or looks aren’t consistent… Ugh! I’m currently reading an ARC of Heart of Venom by Jennifer Estep. And up next is Wicked Beat by Olivia Cunning. JK Rowling tops the list. I know, she’s not romance. But goodness, she can weave a story. I also love Sherrilyn Kenyon, Nora Roberts, Julia Quinn…. I’d better stop now. Purple. Have you seen RtB? I actually don’t have a preference. My name is Jen. I started this blog with one of my best friends, Jessica, in the fall of 2007 as a way to talk about some of our favorite books through reviews. This July we’ll be celebrating 3 years of author promotions! And now we actually have a staff… my how we’ve grown. So, more about me. I grew up as a military brat, but after college, I settled in eastern Washington state. I’ve been a reader since grade school, but during college I fell away from the hobby. After school, I got a job in a public library and I rediscovered my love of books. Back in those days, I almost primarily read mysteries. But then one day I picked up a book by Kat Martin (Hot Rain) and I read my first romance novel (I don’t really count those Sweet Valley High books I read as a teen) and I never turned back. These days I almost exclusively read romance… which is why this blog has been dedicated to the genre. I’ll read just about any book within the genre, although I do have a weakness for historicals, especially a well written medieval romance. Over the next week we’re going to be meeting our staff at Romancing the Book. I’ve asked each of them to tell us their all-time favorite book. I know this is hard for many people to narrow down… I’m one of those people. For the most part I don’t re-read books as there are too many books on my to-read list. However, I will admit that I totally break this rule when it comes to Harry Potter (I know, it’s not romance!). I’ve read the series multiple times (just finished listening to the audio books) and will likely revisit Hogwarts again next year. So for my favorite book, I’ll pick my favorite from the Harry Potter series — Goblet of Fire. Thanks Jen for letting me interview and can’t wait to see you in Savannah! I loved this interview. Thanks Jen for sharing. *high five* to a fellow Nancy Drew fan. I remember my middle school library had the complete collection. Devoured them. If anyone wants to see all our AAD features, they can go to http://romancing-the-book.com/category/aad-featured-author-spotlight. As of today there are 21 done and I know we have about 14 more scheduled! We’ll also be posting from the event in August, as I’m sure all the other bloggers will be as well.